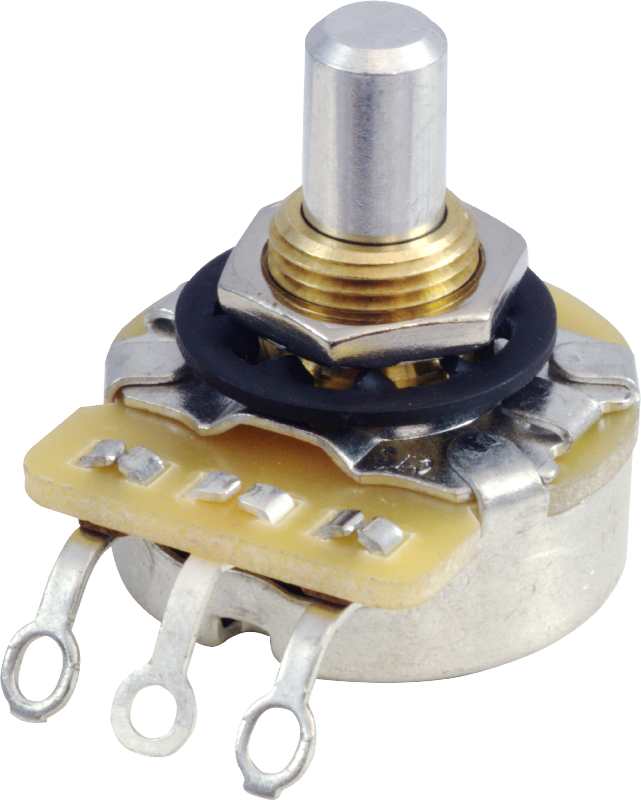 CTS Linear potentiometer,1/4 in. bushing length, solid shaft, &frac38; in. bushing diameter. 10 kΩ R-VC10KL-M Packaging Dimensions 1.252 in. x 1.075 in. x 0.803 in. 10 kΩ R-VC10KL-M Weight 0.031 lbs. 100 kΩ R-VC100KL-M Packaging Dimensions 0.923 in. x 1.237 in. x 1.04 in. 100 kΩ R-VC100KL-M Weight 0.03 lbs. 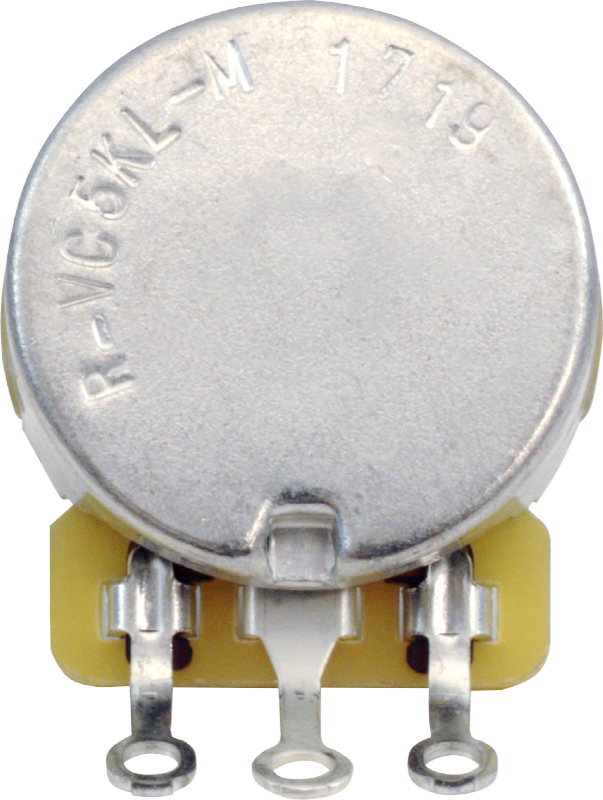 25 kΩ R-VC25KL-M Packaging Dimensions 0.936 in. x 1.27 in. x 1.072 in. 25 kΩ R-VC25KL-M Weight 0.03 lbs. 250 kΩ R-VC250KL-M Packaging Dimensions 0.935 in. x 1.261 in. x 1.069 in. 250 kΩ R-VC250KL-M Weight 0.03 lbs. 5 kΩ R-VC5KL-M Packaging Dimensions 1.07 in. x 1.275 in. x 0.965 in. 5 kΩ R-VC5KL-M Weight 0.031 lbs. All models Bushing Length 0.25 in. It's CTS. What more is there to say? As always great products and great service. Thank you AES. These pots have a tolerance of 20%. I got this information from the customer service. Products work as they should, the supply was lightning fast and my questions were answered immediately. 250K pot measured 256K ohms. Awesome product, super smooth, great price! Use them in all of my builds. Asked by Anonymous on July 19th, 2018. The best thing to do is reference the schematic for your amp. Most schematics will have the resistance (50k) in this example with either an A for audio or L for linear taper. Asked by Anonymous on August 20th, 2018. 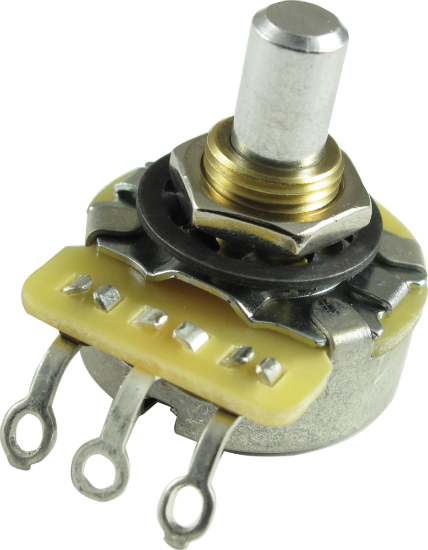 Unfortunately, we do not have cross reference materials to verify if these potentiometers can be used in a Hot Rod Deluxe. You will need to consult an amp tech to verify that information.